Where can I trade Bitcoin futures? One of the most popular bitcoin options, futures contracts, found their way into cryptocurrency market a few years ago. Thus, we provide the answer to the question many traders ask themselves these days: where can I trade bitcoin futures? Bitcoin Futures – What Should You Know about Them? The premise of bitcoin futures is quite a simple one. You agree on terms with a platform regarding bitcoin’s future value at a specific time period in the future. Thus, it is important to have good analytical skills to make accurate bitcoin futures price prediction. 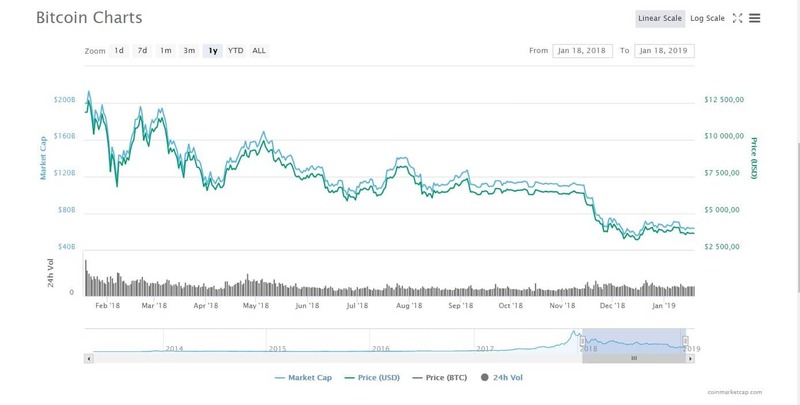 Cryptocurrency market is quite volatile, with values going up and down drastically in a matter of hours. The chart below shows just how much BTC price changes. Bitcoin futures are thus filled with risks as traders can misinterpret trend in the market. Bear trend pushed the price very low, with those betting on growth losing immensely. Hence, bitcoin futures chart plays important role in the investigation, as it pinpoints trends that may occur later on. We wholeheartedly recommend platforms that offer an extensive number of indicators to use, as to gain accurate results from the analysis. BitMEX is one of the most popular sites for crypto futures and one of the first to offer the product. The Seychelles company provides futures contracts for all cryptocurrencies available at the site, Bitcoin included. The fee structure takes into account the type of futures program chosen, with the length of the contract not limiting traders. Thus, bitcoin futures expiration dates are left to last indefinitely. Costs range between a rebate of -0.05% and 0.075%. The leverage rate has a maximum of 100x, while traders should add settlement fees of 0.05% as well. Verification is not part of the requirements to trade futures while only cryptocurrencies are workable at this platform. It is not possible to use fiats, like USD or GBP, while conducting bitcoin futures. Apart from stop-loss functions, BitMEX offers customizable charts, aiding you in price analysis. OKex is a Hong Kong-based business that offers BTC futures as part of its trading portfolio. The platform has several charting services, much like other sites in our guide. However, it also provides many indices that can tell you whether your futures investing is going in the right direction. Interestingly enough, you do not need to verify your account as crypto-to-crypto transactions are only allowed. Thus, it is not possible to do USD-valued bitcoin futures. Bitcoin futures expiration is set to 30 days, while fees range between -0.010% (reimbursements) and 0.0.25%, depending on the volume traded. Unfortunately, there is no leverage trading allowed while anyone, much like at BitMEX, can register an account at OKex. Huobi is yet another Hong Kong crypto business that deals with bitcoin futures, allowing customers to engage in coin trading. Traders from over 130 countries can invest in cryptos in this platform that deals with crypto-to-crypto trading only. Due to China’s governmental crackdown, most platforms got out of the country, Huobi included. Thus, fiat-based futures contracts are not available at this point. As for costs, any sort of order, no matter if futures or simple trade carry maker/taker fees, fixed on 0.2%. Investors should take into account that accusations regarding bitcoin futures volume manipulation have been cleared. However, a certain dose of caution would not hurt nevertheless. The service is available at Huobi’s Derivative Market (Huobi DM). Deribit, much like BitMEX, offers a leverage rate of up to 100x for bitcoin trade, futures included. European platform works globally, while verification is not mandatory. The reason for such development lies, in fact, that platform work with cryptos only. Fiats, such as USD, EUR< or GBP are not part of the futures portfolio. Additionally, fees complement low-cost strategy that many companies employ for bitcoin futures. You have a maker & taker cost structure, ranging from -0.02% to 0.075%, depending on the achieved monthly volume. Traders have one daily settlement, with every Friday being the bitcoin futures expiration dates. BBOD aims to be one of the top bitcoin futures sites in the crypto market by offering complex charting and analysis tools. At this point, you can engage in leverage of 50x, doubly smaller than with BitMEX, for an example. Additionally, its services are available for unverified accounts originating from any part of the planet. However, it is important to notice that said acclaim is yet to be tested this month, as platform finally opens. Until then, keep a close eye on the bitcoin futures Reddit groups, to seek advice and announcements form the company. Cboe (Chicago Board Options Exchange) is an interesting platform. It dealt with mainstream markets before accepting bitcoin futures within its portfolio. With vast experience and financial power behind it, it is possible to conduct futures on bitcoin using fiats as well. Currently, the only accepted fiat currency is USD. However, it is one more than other platforms mentioned in this guide. On the downside, traders should be aware that verification requirements are set in place. Identity checks and documents are part of the said demands while services are available in the U.S. only. Instead of the regular maker/taker costs, the company employs spreads, which is a difference between buying and sell values. For a market that is relatively new, the entrance of new, giant players within its perimeter can enhance existing solutions. Nasdaq, being one of the largest stock markets in the world, announced in 2018 that it will offer bitcoin futures in Q1 of 2019. This piece of news is quite big for bitcoin trading community, as it will offer yet another channel of investment. Furthermore, with organization backing the portfolio with its own vast wealth, it is highly unlikely that liquidity will be an issue. Throughout this article, we intended to provide an answer to where can I trade bitcoin futures. With several platforms already available for you to use, it seems that this particular crypto trading sector is on the rise. Nasdaq and BBOD serve as a proof of expansion, due to the potential gains that futures contracts pose for investors. However, it is important to avoid beginners’ mistakes. Crypto market is a highly volatile industry, meaning that charting skills and caution are mandatory for success. If you would like to read more about where you can trade bitcoin futures and swaps please click here.